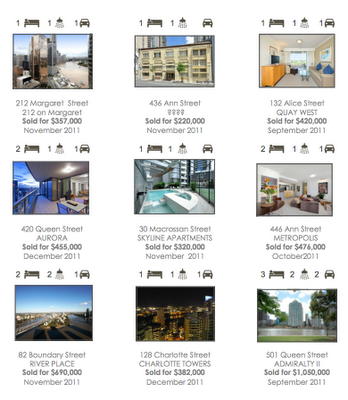 Most of the apartments sold in inner-Brisbane in the past year have been one bedroom apartments. Thus, the medium price will be lower, because the kind of apartments selling are the smaller, cheaper apartments. However, many apartments are being sold below the previous sale price for that same apartment. In a number of buildings, the prices being achieved for apartments are equivalent to prices in 2007. Two bedroom apartments above $600,000 are not selling. If they do sell, the contract often crashes. In some quality buildings, prices have not deceased, but there have been few sales. Vendors are discounting if they need to sell. Rents are increasing, but so are body corporate fees. Apartments being sold off-the-plan are being sold at prices that well exceed the price of similar existing apartments.